Napoleon I, Emperor of France (b. 15 August 1769 as Napoléon Bonaparte, d. 5 May 1821) served as Emperor 1804-1815. He rescinded the exemption of the Mennonites from military service in the lands under his dominion. He generally, though not always, permitted them to employ substitutes, but since it was very expensive to hire a replacement very few could do it. The Mennonites of the Palatinate and Rhenish Hesse tried in vain to maintain their principle of nonresistance. At the momentous conferences in Ibersheim in 1803 and 1805 this was expressly stated. The latter conference passed a resolution to observe a day of fasting, penitence, and prayer. Möllinger, pastor of the Ruchheim (Palatinate) congregation, was sent to Paris to appeal to Napoleon in person, but he was not given audience. The Mennonites had to render military service. On 19 June 1808 a conference of the elders and preachers of the Mennonites of Alsace-Lorraine meeting on the Bildhauserhof near Schlettstadt decided to send two brethren to Paris on a similar mission (see Donnersberg and Alsace). They presented an interesting document requesting the privilege of serving in the transportation corps. If the statement of Elder Augsburger of the Salm congregation is correct, this petition was granted (see France). In 1810, when the Netherlands were incorporated into the French empire, Napoleon interfered with the Dutch churches. They were compelled to subscribe to state loans, which caused the loss of large sums, since the loans soon became valueless. As a consequence, most congregations were unable to pay the salaries of their ministers. An indirect result of this financial deterioration was the founding of the Algemene Doopsgezinde Sociëteit in 1811, since the congregation of Amsterdam was no longer able to support the Seminary. A futile attempt was made by Napoleon to unite all the Protestant churches of the Netherlands, including the Mennonites, into one single Protestant church. Another project, viz., to organize the Mennonite congregations into one body, which was to contact the government by six "corresponding congregations," i.e., Amsterdam, Haarlem, Harlingen, Leeuwarden, Groningen, and Zwolle, was only committed to paper, but never really came into being (see Naamlijst 1815, 58-61; Biogr. Wb. III, 783). The Mennonite congregations were compelled to ask Napoleon's consent whenever they called a new minister, and in 1812, when Rinse Koopmans was chosen professor of the Amsterdam Seminary, his appointment had to be approved by Napoleon, but since the approval failed to come, he could not officially take up his office until 8 June 1814. The order that each minister had to have his sermon approved before it was preached was generally disregarded. The order that Mennonites serve in the French armies was also usually evaded, though a number of young Mennonites were seized and compelled to go to Paris as imperial guards, and even to serve in the Grand Army on its march into Russia in 1812. A number of young Mennonites in the Palatinate were drafted into Napoleon's army and also served on the march into Russia. Doopsgezinde Bijdragen (1872): 126; (1912): 112. Hege, Christian and Christian Neff. Mennonitisches Lexikon, 4 vols. Frankfurt & Weierhof: Hege; Karlsruhe: Schneider, 1913-1967: v. III, 199 f.
Mannhardt, W. Die Wehrfreiheit der Altpreussischen Mennoniten. Danzig, 1863. Naamlijst der tegenwoordig in dienst zijnde predikanten der Mennoniten in de vereenigde Nederlanden. Amsterdam, 1815: 58, 59, 62, 64, 69 f.
Visscher, H. and L. A. van Langeraad. Biographisch Woordenboek von Protestantsche Godgeleerden in Nederland. Utrecht, 1903- : III, 783. Neff, Christian and Nanne van der Zijpp. "Napoleon I, Emperor of France (1769-1821)." Global Anabaptist Mennonite Encyclopedia Online. 1957. Web. 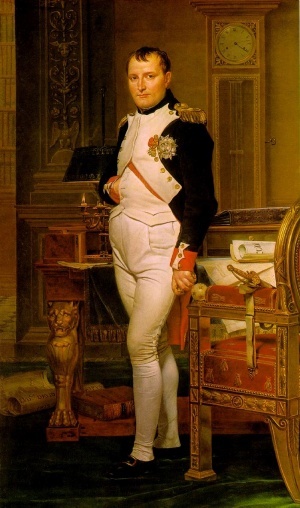 26 Apr 2019. http://gameo.org/index.php?title=Napoleon_I,_Emperor_of_France_(1769-1821)&oldid=145920. Neff, Christian and Nanne van der Zijpp. (1957). Napoleon I, Emperor of France (1769-1821). Global Anabaptist Mennonite Encyclopedia Online. Retrieved 26 April 2019, from http://gameo.org/index.php?title=Napoleon_I,_Emperor_of_France_(1769-1821)&oldid=145920.